Christmas is here and celebrating it with Christmas tree is our tradition. However, holidays with your dog is bound to take some crucial steps to safeguard him and lead a happy and joyful Christmas. There is nothing like having a real Christmas tree, when it comes celebrating Christmas. But, how does this can affect your pooch is a matter of great concern. The smell and look of the real tree is something that brings in more excitement in your furry pal. Real Christmas tree often carry some allergens, a few chemical compounds and unseen molds that can cause allergic reactions and may cause respiratory distress in some pets. If this is the first Christmas, you and your furry pal is spending, then definitely, you might have to learn a lot and undergo a little test before setting up an entire tree. Few days before Christmas, bring a sample of your chosen evergreen tree in your home for few days, allowing your dog to sniff through it but strictly under your supervision only. Observe, if there are any allergic reactions or not, whether is totally safe for your pet. In case, your dog comes up with any negative reactions then remove the branch immediately, wash your pet’s face from allergens and plan to bring in artificial tree instead. In case, your pet is perfectly fine with the real on and go with it. 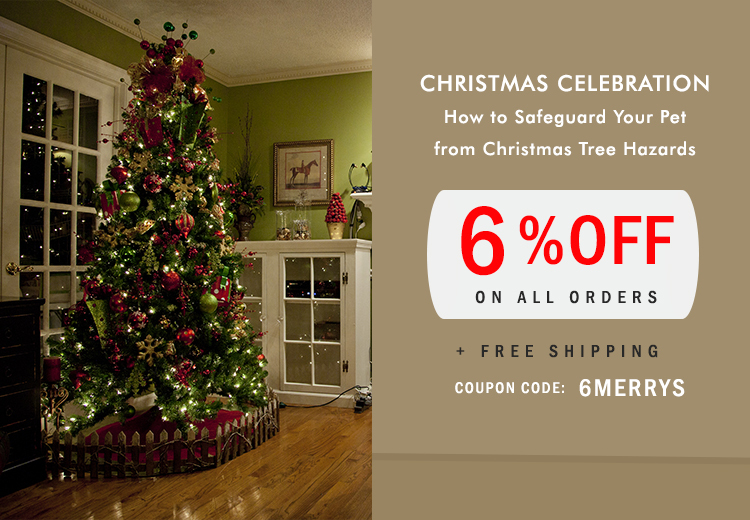 Choosing the right place for decorating Christmas tree is utmost important for the safety of your pet. Think of purchasing a smaller tree rather than huge one, and set it on a tabletop, out of your dog’s reach. In case of big trees, set them up in a corner, where your pet can’t access it easily. If you can, wire the top of the tree to a drapery pole or staircase banister to minimize the chances of tipping it over the top of your dog accidently, in case if he bumps on it accidently. Wrap up the base of the tree and stand in a plastic wrap in order to avoid your dog from drinking the water. This water can be toxic as some chemical compounds or fertilizers can leach from the tree. In place of fragile glass ornaments, look for plastic decorative things. Moreover, hang them on the upper end to resist the temptation of pulling the things if they are hanging low from the tree. Want to put on electric lightening? Hide all the electric light wires behind the tree, neatly wrapped in some plastic. Take care to hide any exposed cords or strategically place pieces of furniture to keep your dog from getting any electrical shock just by chewing them away.